Qualcomm has this week unveiled a new addition to their range of products with the unveiling of the new Qualcomm Ultra Sound NotePad which is being showcased at the CES 2014 technology show this week. Qualcomm has demonstrated how a device equipped with a Qualcomm Snapdragon 805 processor and special microphones can listen for vibrations made by a pen. Watch the video demonstration after the jump to see the Qualcomm Ultra Sound NotePad in action. 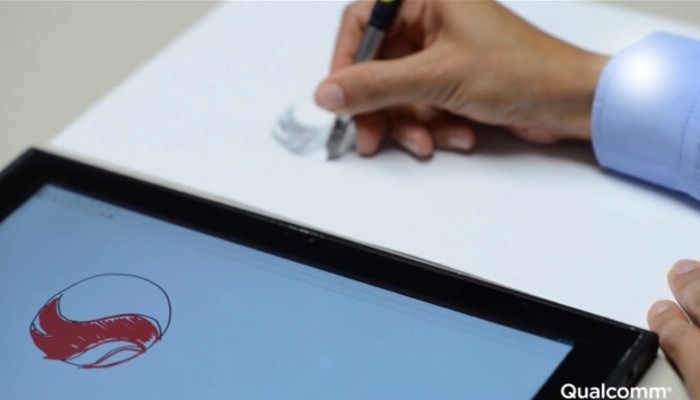 Qualcomm explains a little more : “Using a stylus to write and draw on a touchscreen has been around for a while. But Snapdragon allows you to interact in new ways. Inside the tablet in this video are microphones that can hear ultrasonic vibrations from our digital pen. Unfortunately no information on pricing or worldwide availability has been released as yet for the Qualcomm Ultra Sound NotePad, but as soon as information comes to light we will keep you updated as always.